On August 14, the South Australian government awarded a contract to construct a 150MW solar thermal power plant at Port Augusta, called Aurora, which is expected to supply all of the state government’s power needs. The contract was awarded to SolarReserve, an American developer of utility-scale power projects. Construction of the $650 million facility will begin in 2018 and is estimated to be completed in 2020. This follows another recent announcement regarding an agreement between French renewable energy company Neoen, US sustainable energy company Tesla and the South Australian Government to build the world’s largest (100MW / 129MWh) Lithium-Ion battery in the state. In September 2016, the state government launched a tender process to procure 75 per cent of its long-term power supply in order to attract a new competitor into the electricity market, increasing competition and putting downward pressure on power prices. The launch of the tender followed an announcement that the state government would procure 25 per cent of its electricity load from dispatchable renewable energy providers in order to drive innovation in storage and other technologies. As a large, dispatchable renewable energy generator, SolarReserve provides a single solution that delivers on the goals of both those initiatives. 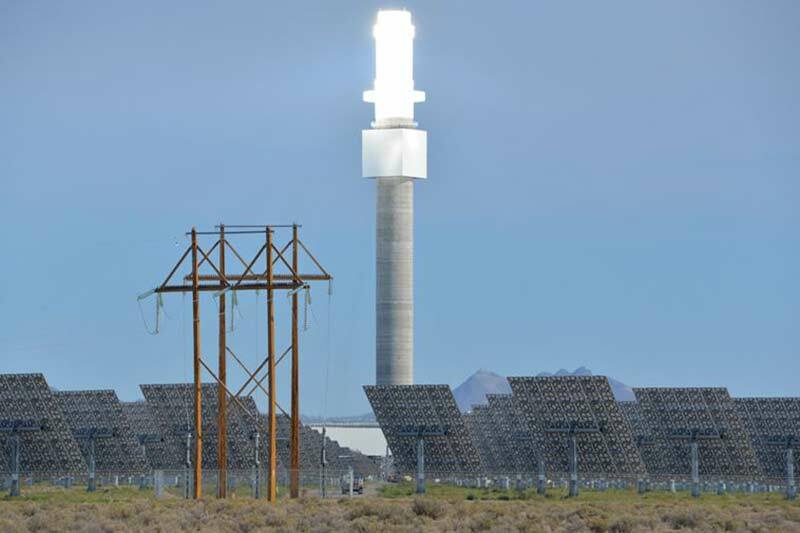 A thermal solar power plant uses thousands of mirrors (heliostats) to reflect and concentrate sunlight onto a central receiver on top of a tower. The process heats molten salt, pumped to the top of the tower and flowing through the receiver, to 565 degrees Celsius. The molten salt provides a stored heat source which is used to generate steam to drive a single turbine that generates electricity. The facility can generate power at full load for up to eight hours after sunset. This means that means that they can contribute to network stability and reliability when coupled with built-in storage. Energy can be dispatched into the grid when needed – even when the sun isn’t shining. This will allow for greater levels of renewables to be integrated into the system. Under normal operating conditions the plant will have a net capacity of about 135MW, with the ability to increase that output in favourable conditions, such as in the evening. Peak Government load is as high as 125MW but lower for most of the day and far lower outside of business hours. Throughout the day, whatever Aurora is producing in addition to the state government’s demand can be sold into the market which will help other consumers. The Government has entered into a Generation Project Agreement (GPA) with SolarReserve for the Aurora Solar Energy Project to supply the State’s current load for a period of 20 years. The Government will pay an expected levelised price of $75/MWh, and no more than $78/MWh. The GPA contract has been structured to ensure the State gets the benefit of lower spot prices that are expected to arise from the large quantity of renewables entering the South Australian market. “By using our purchasing power to underwrite the entry of a new player into the market, we can increase competition and put downward pressure on power prices for South Australians. The Aurora Solar Energy Project will also create new, advanced employment opportunities in regional South Australia. We are using our energy plan to drive investment and jobs in this growing sector,” Energy Minister Tom Koutsantonis. “Along with our grid-scale battery, this solar thermal facility firmly entrenches South Australia as a world leader in the storage of renewable energy. This facility, in addition to our State-owned power plant and the world&apos;s largest lithium ion battery, will help to make our energy grid more secure,” he added. The federal government has welcomed the announcement and asked SolarReserve to provide all the project details. The government will ask the Australian Renewable Energy Agency (ARENA) to work with the Clean Energy Finance Corporation (CEFC), in consultation with the Infrastructure and Project Financing Agency (IPFA), to provide the Government with advice on the project.